For those of you expecting a new TWD recipe today (semolina bread), we chose to forgo today’s recipe, due mostly to excessive heat, making the idea of turning on the oven an unappealing one to say the least. However, we may redo it at a later time if the weather cools down. Also, unlike some of our previous experiments, semolina bread is much more difficult to convert to gluten free. 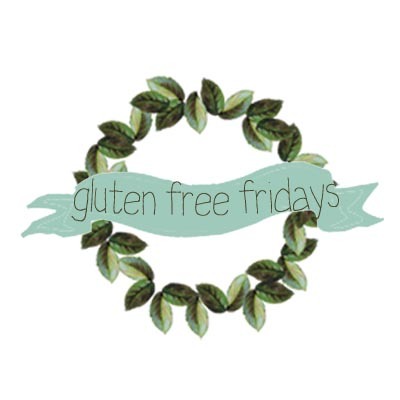 No gluten free substitute flour will taste exactly like semolina, or comes even close. Since the general TWD recipe line up calls for two participations per month, and July happens to have three this year, we felt it would be okay to sit one out. Since much of the US is suffering under an incredible heat wave at the moment, we thought a recipe for an ice-cold drink, would be a welcome substitute. In the past, while living in the Pacific Northwest, the sun always held a very special place in our lives, as it probably does for most people living there. At the slightest glimmer of the sun’s rare appearance, everyone rushes outside, even risking sunburn to bask in it. Here in the desert, the opposite tends to be true. Don’t get us wrong, we still love the sun, but it holds a much greater strength at our high elevation. Here, houses have wide overhanging roofs, smaller windows, and high walled gardens, all in an effort to shield from the sun. Outdoor Summer activities, by necessity, are approached differently, always with a concern for appropriate shade and hydration. 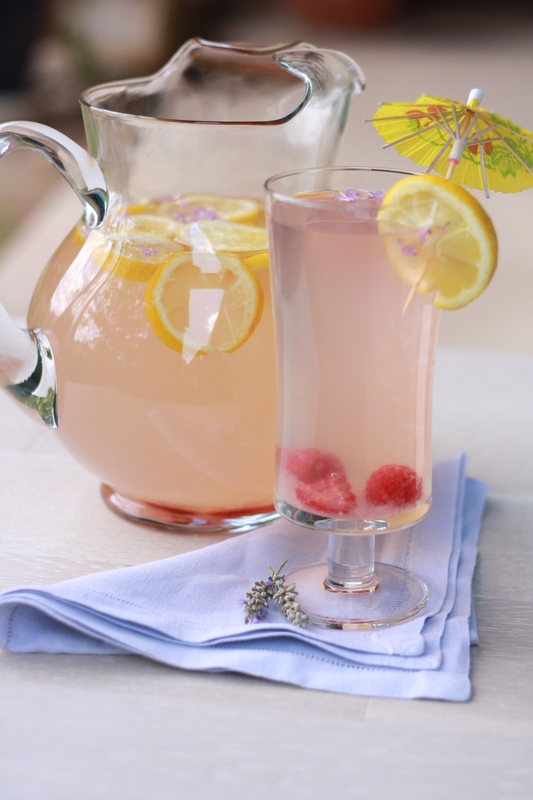 Like July 4th and barbecues, lemonade is one of the classic rights of Summer. We’re not big fans of commercial soft-drinks in general, but home-made lemonade is something that makes a great alternative. Making it ourselves also allows us to control how much and what kind of sugar is being used. 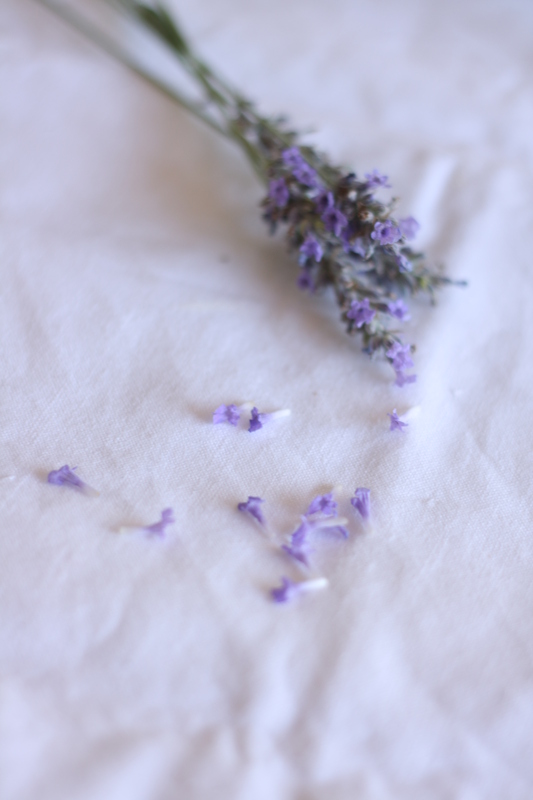 Loving the bright light of the New Mexico sun, lavender grows easily and blooms with the most beautiful flowers throughout the month of July. Its aromatic fragrance fills the air, and we wanted to capture its unique essence in our lemonade. Like many common garden flowers such as roses, nasturtiums, johnny jump ups, and marigolds, lavender is also edible, and makes a delicious addition to chocolate, drinks, and baked goods. Ahead of time, fill one ice-cube tray with purified water, and place one or two raspberries inside each section. Freeze for several hours, or over night. 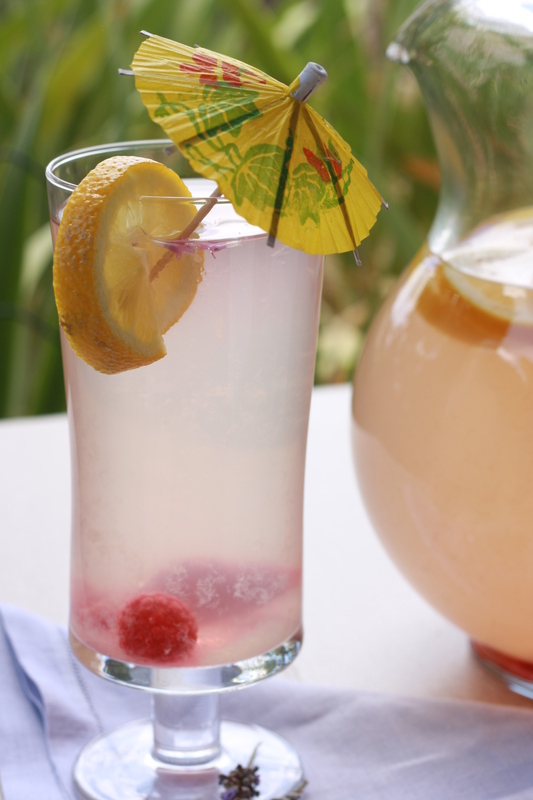 In a pinch, you can add fresh raspberries directly to the lemonade, and just use plain ice. Juice 6 lemons, straining all the seeds. Fill a glass jar with two quarts of water, and add the lemon juice, lemon slices and sugar, stirring until completely dissolved. Finally, add the ice and raspberries, top with the lavender blossoms. Allow the lemonade to be infused with the flavor of the lavender, by placing the lemonade in the refrigerator for about thirty minutes. Stir a couple more times before serving in tall glasses. Enjoy poolside, or under the shade of a tall tree. We are on a constant quest to stay hydrated, not always easy to do in the arid southwest, where the normal eight glasses of water a day are never enough. This lemonade really quenches the thirst, making it much easier to achieve the balance we are looking for. Here is to a fun week ahead. Stay cool and hydrated. This is beautiful! My lavender is blooming (like yours) and I have raspberries already in cubes…now to just make the lemonade! Delicious! Your photos are just as delightful looking as the drink! Gorgeous photos! Anything with lavender in it is a winner in my mind. Too humid in Memphis for lavender to do well., so I’ll enjoy vicariously. Looks lovely. Can all lavender be used in drinks do you know? I have some I inherited with my garden, but I haven’t dared to use it yet. And do you wash it somehow first? Mine seem to have little bugs in them, that I’d not really be keen on finding in my drink…! As far as we can tell, all lavender is edible. 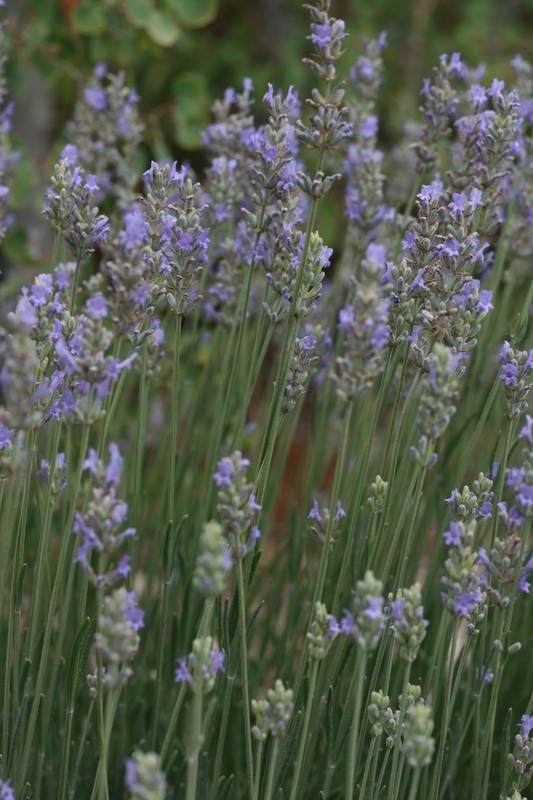 Just be sure it hasn’t been sprayed with anything, The kind we used, and that grows in our garden, is English lavender. Washing it thoroughly would probably take care of the little critters. 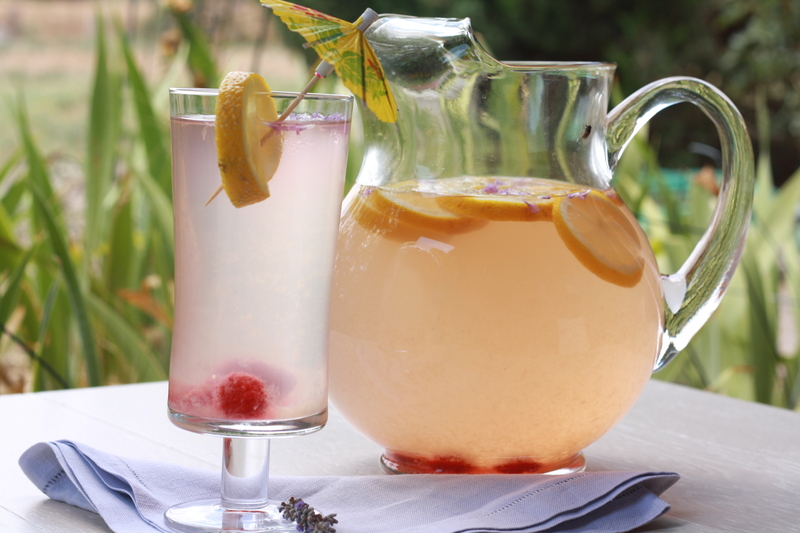 Lavender does impart a wonderful flavor to the lemonade, well worth the effort. Best of luck. 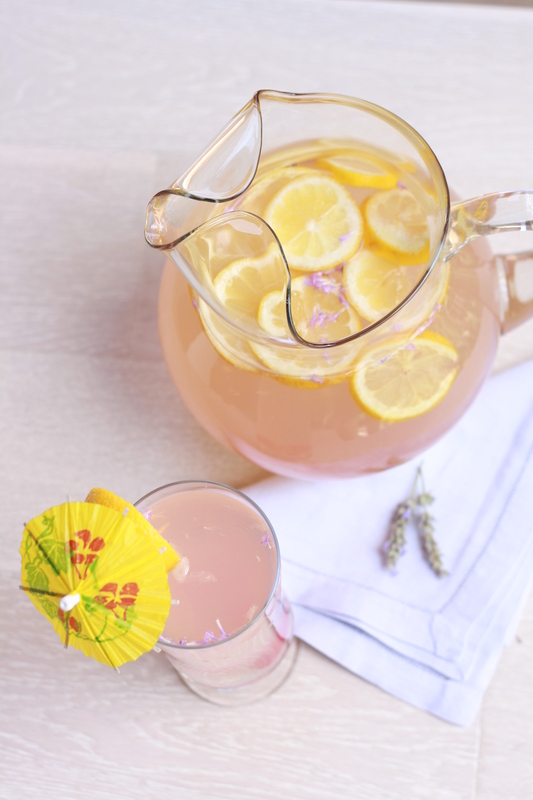 I love your summery pictures of your Lavender Lemonade! The colors are just beautiful! Once in a while we enjoy the taste of lavender in our food and drinks so I baked some Lemon – Lavender Shortbread with organic dried lavender from my favorite health food store – not a gf recipe though – but we liked the combination of lemon and lavender and I am sure that your lemonade tasted just wonderful with these two flavors! This version of lemonade has become a favorite. We also really loved photographing it.